Цврста, водоотпорна, 360 степени видео Action Camera 5.7k/30fps резолуција, 4К сверна стабилизација и GPS/GLONASS. VIRB 360 is the first of its kind, capturing a complete sphere of high-resolution video and audio — even photos. It eliminates the lengthy editing process with unrivaled 1-click video stabilization up to 4K resolution at 30 fps and allows you to instantly livestream5 any adventure. If it’s worth remembering, it’s worth a VIRB 360. This rugged, waterproof camera is true to its name, recording the full 360 degrees — horizontally and vertically. And you can forget about timely post-production work, because VIRB 360 will auto-stitch¹ your 4K footage in camera. If you’re looking for higher resolution, you can record video in unstitched 5.7K resolution at 30fps, and stitch it together in VIRB Edit. Get even more control with different recording modes such as time lapse, manual, and the powerful new HyperFrame Director Mode, which gives you the editing power to easily reframe content after filming — using smooth camera pans, incredibly wide angles and even tiny planets. Even capture 360-degree photos, burst shots, time lapse and Travelapse™ photo capture up to 15 megapixels — stitched in camera. Combined with the 4 built-in microphones for 360-degree audio, you and your viewers will be totally immersed in the 360 experience. Take a shaky, hard-to-follow video, and turn it into a smooth and stable masterpiece in 1 click. Regardless of camera movement, the 3 modes of 4K spherical stabilization² ensure a smooth video. Stabilize mode smooths quick movements and vibrations without overriding camera orientation. Use lock mode to secure the orientation of the camera in a specified direction. In follow mode, the orientation follows the GPS trajectory. There’s even stabilization for 5.7K, RAW video stitched in the VIRB Edit desktop app. Check out the video to see the difference our advanced stabilization makes. With the free, easy-to-use VIRB Mobile app and VIRB Editdesktop software, you can edit, stabilize, share and add data overlays to videos. 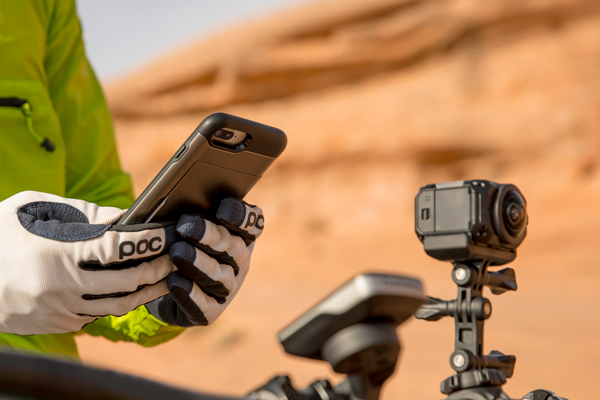 Use the VIRB Mobile app to connect the camera to your Apple® or Android™ device. Connect your NFC-enabled Android smartphone to the camera with just 1 tap of your phone on the camera. Then, use your smartphone as a remote control for the camera, see live 360-degree video of what you’re recording, use a virtual reality (VR) device to instantly view your 360 videos in VR, or livestream to YouTube® and Facebook®6. Retell your story in greater detail than ever before. Built-in sensors, such as GPS and GLONASS, barometer, accelerometer and more, provide countless customizable G-Metrix data overlay options in 360-degree augmented reality². Just select premade templates of the data points you want, and see your custom data overlay displayed in your video. Other compatible Garmin sensors and devices pair with your VIRB to extend camera control and provide detailed, measurable data tailored to your activity. Check the Compatible Devices and Accessories tabs for a list of compatible products and sensors. “OK Garmin, start recording.” It’s that easy. When you are about to speed down a rugged hillside, chances are you don’t want to reach up and press start. Now you can just use a voice command7, and the camera will start and stop recording and take photos. Or ask VIRB 360 to “remember that” to tag specific moments in your adventure and quickly find them again later. This rugged camera is built to endure everything from a whitewater adventure to a child’s birthday party. VIRB 360 is waterproof to 10 meters, small and lightweight enough for any adventure, and it features strengthened glass lenses you can easily replace without tools. The camera works with our durable mounts as well as other standard mounts and accessories, and it can shoot more than 1 hour on a single battery charge4. The sunlight-readable display shows battery, storage, mode and connectivity status. VIRB 360 can do it all. For the best viewing experience, we recommend you watch 360 videos in the YouTube app on a mobile device or tablet. To view interactive 360 YouTube videos on a desktop, you’ll need Google Chrome, Mozilla Firefox or Microsoft Edge. Apple is a trademark of Apple Inc., registered in the U.S. and other countries. Android is a trademark of Google Inc.